Microsoft is highlighting previews of Windows 10 that would include new features – 'Timeline' and 'Sets' – aiming at boosting productivity on a PC. Microsoft this week announced that upcoming previews of Windows 10 would include new features designed to boost productivity on a personal computer. Dubbed "Timeline" and "Sets," the former previously trumpeted months ago, the latter a revelation, the pair will, promised Microsoft's top Windows executive, "help make the most of time, one of our most precious resources." Sets was the more interesting of the two, and not only because it is brand new. Instead, it was Sets' potential that struck a nerve. 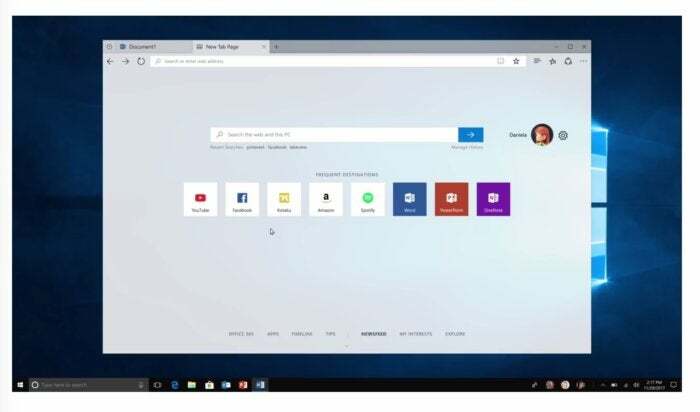 PCWorld's Mark Hachman, one of the handful of reporters and bloggers briefed before the announcement, said that Microsoft, "plans to overhaul Windows 10" with a single-frame-with-multiple-tabs interface that resembles one of today's browsers. While the overhaul Hachman envisioned won't take place overnight - or perhaps ever - the two additions to Windows 10, Sets in particular, are among the most significant with the most promise for affecting change in how the OS assists business. We dug into Timeline and Sets, came up with the things users want clarified, then answered those questions. What is Sets? At the simplest level, Sets is a user interface (UI) that relies on tabs within an encompassing frame to organize and define multiple applications. In other words, just as a browser window contains several tabs, each defining a different website or web app, a Sets "window" groups several applications - say Edge, Word and Mail - so that each is accessed through a tab. To change the active application, users click a tab rather than navigate to the desktop and click on its window. Apple added tabs to its Finder file manager back in 2013 with OS X Mavericks; Windows 10 Insider participants have voted the same idea up to the fourth spot in the program's wish list. But neither operating system has taken the next, arguably major, step of making tabs a critical component of the UI and UX (user experience). Just like in a browser, adding a tab to Sets displays a "new tab" page with, in Sets' case, icons representing the user's most frequently opened apps. When will Microsoft start testing Sets? "In the coming weeks," according to the company. If the holidays were not looming on the calendar, we'd say before the end of 2017, what with Microsoft's coming weeks phrasing. What will be Microsoft's first step toward Sets? Timeline, the feature the company first touted in May during its Build conference. Timeline is slated to hit Windows Insider with the next preview, said Dona Sarker, the public face of the program, in a Nov. 28 post to a company blog. Sarker did not hint at a date, but the previous was a week before, and it wouldn't be unreasonable to expect a successor this week. Refresh my memory...what's Timeline? 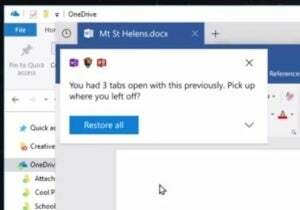 It's a Windows 10 productivity feature, that for a better description, returns the user to a former moment on a device for resumption of a task; that could be a return to the last-known location in a document since set aside, the place in an app where work was suspended or a browser tab that was active before the PC was shut down. Each of those past moments would be represented in Timeline by an on-screen "card," which when clicked opens the document to the pertinent spot, fires up the app to resume work or refreshes the browser to the again-active tab. When it was trumpeted at Build, Timeline was slated to show in Windows 10 1709, aka the Fall Creators Update, the feature upgrade that launched Oct. 17. It didn't make the cut, however, and several months before 1709's release, was withdrawn, presumably for a latter upgrade. It now seems probable that Timeline will appear in 1803, the next upgrade, in March or April of next year. What's the purpose of Sets? Microsoft's Terry Myerson, the firm's top Windows executive, said in an email to Insiders that Sets is "a way to organize your stuff and get back to what you were doing." The goal, however, is right up the productivity alley. "With Sets, what belongs together stays together - making it easier and faster to create and be productive," Myerson said. "The concept...is to make sure that everything related to your task: relevant web pages, research documents, necessary files and applications, is connected and available to you in one click." By gathering apps necessary for a specific task into a single frame, then remembering that collection, Microsoft believes Windows 10 - and its own apps, naturally, like Edge and Office - can boost productivity. That's the company's prime pitch to its most important customers, commercial organizations from small businesses to multi-national corporations. Now without a mobile operating system or a smartphone business, Microsoft's financial future is tied to the older technologies of the personal computer. It must argue that the PC remains relevant, and successfully demonstrate that it is superior to other devices, notably phones and tablets, in handling, streamlining and completing in-business tasks. Sets fits that mandate. This example Set shows three tabs, and three apps. From left to right, they are Word, OneNote and Edge. Since Microsoft talked up both Timeline and Sets, is there a connection between the two? Yes. The same Timeline mechanism that remembers a document's last-used status will memorize a specific Sets' composition - the apps opened as tabs, the documents or files or accounts visible in such tabs - and record it as a past moment. Searching the Timeline cards, or simply returning to the most recent, will locate the multiple-app setup. A click will return the user to that Sets' past. Will Microsoft replace the current Windows 10 UI with Sets? Not likely. Or maybe more accurately, not likely for the foreseeable future. There's no evidence that Microsoft plans to abandon users' UI/UX familiarity with a multiple-windowed UI - and undo their decades of experience in operating such UIs - for a sudden swap of tabs. For instance, Sets will be optional. But? There's usually at least one of those around. A single-frame, tabbed UI seems tailor-made for Windows 10 S, the 10 Pro spin-off that Microsoft boasts is more secure because it runs only UWP (Universal Windows Platform) apps, the ones available only in the Windows Store. First, that's because Sets and its tabs will only accommodate UWP apps off the bat. (Microsoft plans to open the UI to non-UWP programs, including classic Win32 applications, at a later date.) Second, the simplicity of Sets jibes with the philosophy behind 10 S.
It wouldn't be a big jump for Sets from optional on Windows 10 to still-optional-but-enabled-by-default on Windows 10 S. Microsoft has made scores of moves far more dramatic than that in the recent past. Re-opening the Sets' initial document displays this prompt, as Windows 10 asks if the user wants to pick up where they left off, including opening the other two tabs' apps. Is there anything out of the ordinary about how Microsoft plans to preview Sets? In fact, yes. Not every Insider will see Sets initially, as Microsoft is running an "A/B test" - sometimes referred to as a "split-run test" - where a portion of the group gets the feature, while the rest does not. "We'll introduce a controlled study into WIP [Windows Insider Program] so that we can more accurately assess what's working and what's not," wrote Myerson in his email. "That means a smaller percentage of you will initially get Sets in a build. It also means that some of you won't get it at all for a while, as we compare the usage and satisfaction of task switching in Windows for people who have sets versus people who don't." Although Microsoft has used Insider for A/B testing before - rolling out a feature to a subset of the whole before letting it loose - the emphasis Myerson put on the technique here was unusual. During Windows 10's pre-launch period, Microsoft was open about Insider's prime purpose as a bug finder, but it has shifted that messaging about the preview program, instead stressing the feedback aspect and hammering on how beta testers' responses help guide development. Sets' use of Insider sounds a lot like the kind of focus group testing that marketers run, where consumers are asked questions while the testers sit behind mirrored glass. It may signal an even broader use of Insider as a marketing tool in the future. This story, "FAQ: Windows 10's new browser-ized UI – Sets" was originally published by Computerworld.